Short stories are a reader’s delight, for the concise plots with invigorating plot turns can be read in less time compared to novellas. When these stories have riveting psychoanalytic plots and complex protagonists, this is altogether enrapturing and makes one sit up on their reader’s seats and couches with an even more delightful thrill. 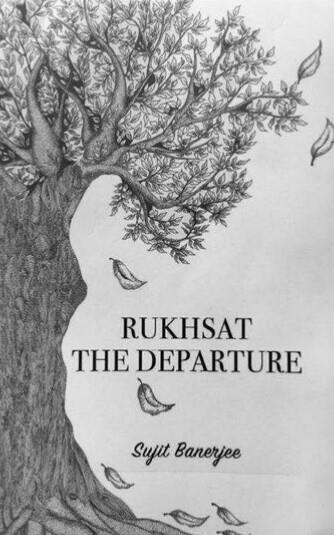 The author Sujit Banerjee comes up with such a book “Rukhsat The Departure” which is a gripping short story collection. The front cover of the book shows a pencil sketch of a tree, with its leaves falling- signifying their rukhsat from the tree. However, a better job could’ve done with the book cover and instead of the black and white colours, subtle hints or even profuse infusion of brownish and auburn hues– the colours of autumn foliage, would’ve done wonders for the book cover. The blurb at the back cover is lucid and expressive, and as it claims for the stories, it will also leave an indelible mark on the reader’s soul after definitely making them pick up the book. This book is a collection of twenty six short stories- each story titled with a name beginning with a different letter of the alphabet. The stories are very impactful with strong characters, and the enigmatic storylines with gritty realities woven within will leave the readers bewildered. Various psychological aspects pertaining to the dark sides and mindsets of the protagonists have also been dealt with astuteness in the stories which can be explained from the fact that the author is a trained psychologist. The stories are titled Abhimanyu, Bhushan, Chitra, Devesh, Eklavya, Farzana, Lotika, Qamar, Varun and such- and having derived the titles from names of protagonists from alphabets A to Z, this also trickles down in the narratives as the many-layered and complex characters are also the strength of this book. There is a story about a woman desperate for her husband’s attention, and a story about an illegitimate son yearning for answers for his painful questions. There are stories about a dead man’s trial, a childless woman intertwined with her love for music, a gay man’s memory of a one-night encounter, and a jealous lover with a twisted brain. The writing style is exceptional and the reader falls in love with the lucid expressionism and simplistic writing within the book’s pages. This is a book that should be read for its amazing short stories, which stimulate and intrigue the mind in equal measure. Also, though each story is scintillating in its own right, it is the panorama of emotions that these stories evoke as a whole, and the viewpoints that they make one discern having read them in totality, which makes this short story collection stand out. That the emotive intensity and thought-provoking gusto is accompanied with excellent writing and beautiful words makes it a remarkable read.